I was looking for some new oatmeal to try and happened to see this giant box at my local store. It is so delicious and perfect for a quick hot meal on a cold day. They have a variety of flavors, however I just went for the traditional to try first. 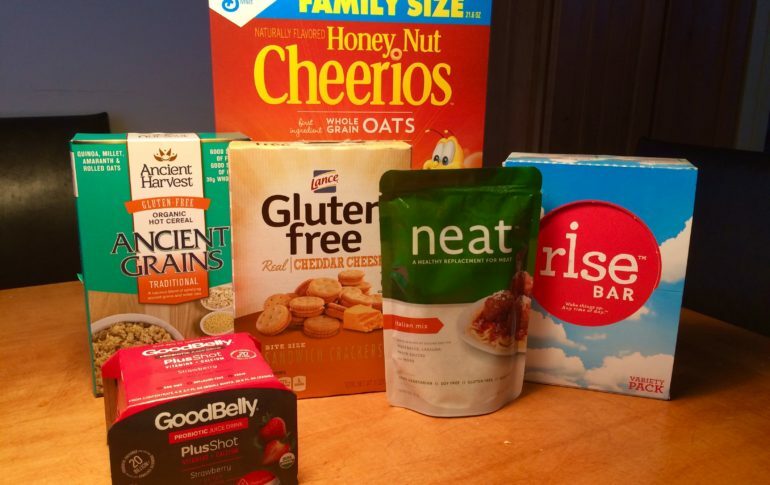 This box also includes 6 packs of oatmeal that is super convenient to just grab and cook it up. I add some fruit, coconut chips, and a tiny bit of honey to mine for a bit more flavor. All Cheerios are now gluten free! To celebrate this new development and as a bit of nostalgia I had to buy some and see if they were as good as I remember. They are just like the original, they have simply just looked at the grains more carefully to make sure all the grains are gluten free. Another piece of nostalgia this month are these little cheese and cracker bites. I used to have something similar for lunch when I was a kid and was more than happy to try these. They are delicious and work great as a quick mini snack throughout the day. They also have snack pack ones and ones with peanut butter instead of cheese. I wanted to try a new fake meat meal, so I decided to give these a try. It is basically a mix so you can make your own meatballs for pasta. They are so easy to make up and delicious to eat. I just made them up and then stored them in my fridge for later consumptions throughout the week. They also have a version for tacos, burgers, and sausages. I was in search for a new protein bar to have after my workouts at the gym. These rise bars are so healthy for you that I had to give them a try. I picked up the variety version to try out a bunch of the bars at once and found I liked almost all of them. They are packed with protein, flavor, and deliciousness. They only use real ingredients and only a few so you don’t have to worry about added sugar or unnatural ingredients. I wasn’t quite sure what this entirely was when I first picked it up at the store but was intrigued. Basically it is a shot size dairy-free, vegan yogurt that is packed with billions of probiotics and essential vitamins and calcium. It is also supposed to help your digestive system. It also comes in other flavors, however the strawberry was delicious for me. I also found that it’s small amount was a perfect amount for me and great for a quick snack.